Payment: For reservations with arrival dates 31 days or more in the future, we will require a minimum of $150 at the time of reservation, via major credit card only. Thirty (30) days prior to your arrival, the credit card we have on file for you will be charged the final balance. We DO NOT mix payments, if you make your initial payment by credit card the remaining balance must be paid by credit card. You will receive a reminder email regarding the automatic balance due transaction and the amount to be charged. Please see our cancelation policy described below, should you need to change or cancel your reservation beyond 30 days of arrival. For reservations with arrival dates within 30 days, payment is expected in full at the time of reservation. Please see our cancelation policy described below, should you need to change or cancel your reservation within 30 days of your arrival. ALL BALANCE DUE PAYMENTS ARE TO BE PAID 30 (THIRTY) DAYS PRIOR TO YOUR ARRIVAL. If full payment is not received 30 (thirty) days prior to your arrival, the reservation is subject to cancelation with no refund. Cleaning: Our vacation rentals require a one-time non-refundable cleaning fee which varies by the size of the home. This covers general cleaning such as the bedding, towels, bathrooms, kitchen counters, floors, and dusting. We ask that you please leave the home in the same condition you found it. See “Check-Out” section for details. If the home is found to be excessively dirty you may be charged an extra cleaning fee at a rate of $50/hour with a minimum of 1 hour. If the home provides a BBQ grill, we ask that you please be considerate and clean it after each use. If the grill is found to be dirty a minimum fee of $25.00 may be charged. Check-In and Obtaining Keys: Our cleaning and maintenance crews are working hard to make sure every home is rental ready so please adhere to the 4:00 PM check-in time, unless you have made advanced arrangements through our office for an early arrival and have received approval. Keys can be picked up at the Coastal Property Management Office before 5:00 pm. We are located at Hwy 101 & 20th St, just 1 block south of Dutch Bros Coffee. If you are arriving after 5:00 pm or on the weekend, please call our office in advance to make arrangements for keys. When checking in on a weekend, if you are renting a home with a kayak/canoe you will be responsible for making arrangements to sign the liability waiver BEFORE any canoe keys will be released to you. Upon arrival please inspect the home. Please report any issues noticed immediately to our office so that they can be addressed. Please be considerate and remove your shoes upon entry to the unit! Supplies: For your convenience, you will find a starter supply of toilet paper, paper towels, shower gel, dishwasher detergent (if applicable), liquid dish soap, laundry detergent and hand soap. Florence Oregon Vacation Rentals does not replenish supplies during your stay. All bedding and towels are provided. If your home has a wood-burning stove or fire pit, firewood is available locally and will not be furnished by Coastal Property Management/Florence Oregon Vacation Rentals. Safety: We provide comfortable and quality surroundings for our guests so that they may fully enjoy their stay. We ask that you use care with the accommodations so that others may also enjoy them. Please do not leave children under the age of 16 years unattended in the unit or unsupervised on the property. If your rental has a dock with water access, please do not leave children unattended. Wear appropriate life vests near or in the water (some of our properties provide life-vests, please see specific property amenities). Please - no glass on the dock area. For properties with any stairs and/or steps, please use caution when going up or down stairs and hold onto handrails if available. Do not sit on railing if applicable. Hot-Tubs/Jacuzzi: Some of our units offer hot tubs. Please observe and adhere to all rules and policies as posted at the unit regarding the safe use of the hot tub. The hot tub and surrounding patio/deck can be dangerous and can be slippery when wet. You accept and assume all risks involved in or related to the use of the hot tub and patio/deck areas and release Florence Oregon Vacation Rentals/Coastal Property Management and the home owner from any and all liability or loss that may result in connection with the use of the hot tub. 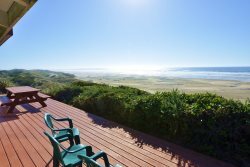 Florence Oregon Vacation Rentals makes no guarantee related to the hot tub. Gas Fireplaces, Woodstoves, Pellet Stoves: Please follow safety instructions posted in your rental regarding proper use of stove/fireplace. A small supply of pellets should available within the home for guests. Firewood bundles are not provided and can be purchased locally. Smoking: Smoking (of any substance) is not allowed in any of our rentals. Violations may result in a $500.00 penalty. Noise/Disorderly Conduct: Excessive noise and/or disorderly conduct shall be grounds for notice to terminate the rental agreement and a minimum fine of $250.00 will be charged. Guests shall restrict vocal, instrumental, radio and television noise to a reasonable degree of volume. Maintenance/Repairs: Should maintenance or repairs be required at the home during your stay, please notify us immediately and allow access of the home to a representative of Florence Oregon Vacation Rentals/Coastal Property Management to make the necessary repairs. Please notify our office at 541-997-1351 (after-hours, 541-991-2018) immediately if you are unsatisfied with the condition of your rental home upon your arrival. No more than 2 dogs are allowed at any property. Pets must be on a leash at all times. You must clean up after your pet in the yard, the neighborhood, on the beach, etc. This is not the responsibility of the housekeeper and a minimum fee of $50 may be charged if we must clean up after pets. If there is evidence that an animal has been in a non pet-friendly home, you will be billed a minimum fee of $250 to clean carpets, upholstery, etc. since many people have severe allergies to pet hair and dander. There are facilities in Florence for boarding your pets, please call for information. Long-Term Stays: For rentals exceeding 2 weeks, we ask that you maintain the appearance of all tubs, shower stalls, toilets and floors to prevent heavy soiling or possible damage. Garbage and/or Recycling Pick-up: Should your stay coincide with the routine pick-up scheduled for your home, please be courteous and take any trash and/or recycling to the designated area on the designated day. This information will be discussed in each home's specific description. Florence Oregon Vacation Rentals thanks you for your participation! Check-Out: Upon your departure, please return keys to our office, or if you are checking during non-business hours, you may leave them in the drop box labeled "Rent/Key Drop" under the black awning to the west of our front door. Check Out time is 11:00 am sharp – if you are still in the home when cleaning crews arrive you may be billed for their time at $50/hour with a one hour minimum. Florence Oregon Vacation Rentals is not responsible for lost or stolen personal property. Claimed items will be returned COD and items not claimed after 30 days will be disposed of. Before departing please remove all food items from the refrigerator/freezer, make sure all dishes have been washed and put away (if the home provides a dishwasher it may be left running), collect all garbage and dispose of bags in proper trash receptacles and lock all windows and doors. Please take all soiled towels to laundry area and wash one load - you may leave cycle running. Please do not wash the bed linens at the end of your stay - our cleaning crews will take care of this! Damage/Theft: Florence Oregon Vacation Rentals/Coastal Property Management reserves the right to charge your credit card for damage, theft, or excessive cleaning as a result of your tenancy in the unit. Furniture should not be moved in any unit. You will be billed a fee of $30 per hour to return moved furniture to its proper location. Any breach of the terms and conditions above may result in an eviction from the premises and/or additional fees. This Agreement shall be governed by and interpreted in accordance with the laws of the State of Oregon and shall be treated as though it were executed in Lane County. Any action relating to this Agreement shall be instituted and prosecuted only in Lane County, Oregon. Guest specifically consents to such jurisdiction and to extraterritorial service of process.